Please see picture below. What it takes to implement feature allowing exceptions extraction to a separate file during command line profiling? Any chance this can be done in the nearest future? I'm afraid this isn't currently possible but I'll raise an internal case and see if there is any appetite to do it. Hi Alexander, this is something we'd like to investigate further - could you please give us an idea of how you'd like to use it? Is it only a case of exporting a human-readable list of exceptions? Or would you rather have a CSV/XML exported for further processing? Is it crucial for your use-case to do it from the command-line, would you prefer strictly an option in the GUI, or both? Hi @Russell D , during our tests we often see a lot of exceptions including internal unity exceptions related to illegal registrations. They are caught and suppressed internally (so we could no catch them) but they affect performance so we would like to track rate of exceptions and group them by type, i.e. 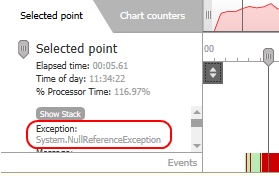 unity exceptions rate, application defined exception rate, etc. We have automated performance testing framework that tests more than hundreds services per day but could not track first chance exceptions so we would like to reuse RedGate's ability to do that (Red Gate command line perf profiling is one of the steps in our testing pipeline and in case we have alert we open profiling results file and investigate it). So we actually need list of exceptions in any format (json preferable), so that we could post process them and raise alerts during automated testing if required. We're going to look into this in the future - sorry I can't be more specific with a timeframe but its gone onto our backlog as something we would like to do.